The Wishing Well is a charity single released by G.O.S.H. (Great Ormond Street Hospital) on 20 November 1987 by MBS Records. Featuring a ensemble line-up of pop stars, Noddy Holder was one of the main vocalists on the song. The single raised money for the Wishing Well Appeal, which was launched to raise money for the redevelopment of the Great Ormond Street Hospital. The song reached No. 22 in the UK and remained in the charts for eleven weeks. It was written by Chris Copping, and produced by Ray Santilli and Keff McCulloch. In 1986, the Great Ormond Street Hospital in London launched their Wishing Well Appeal, which aimed to raise £30 million for the redevelopment of the hospital, including the construction of the Variety Club Building. 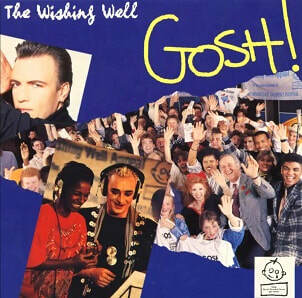 During 1987, the charity single "The Wishing Well" was released as part of the appeal. The song, written by Chris Copping, was recorded at MBS and PRT Studios in London and featured a number of pop stars and celebrities. The song's main vocals were provided by Boy George, Peter Cox, Hazel O'Connor, Grace Kennedy, Dollar and Holder. Some of those contributing to the chorus vocals were Bonnie Langford, Sylvester McCoy, Jimmy Nail, Hollywood Beyond, Uriah Heep, Showaddywaddy, Andy Scott of The Sweet, Busta Jones and Hot Chocolate. According to Jane Waldegrau of the Wishing Well Appeal, Holder was the "life and soul" of the recording session. In addition to appearing on the song, Holder also became an official "Well Wisher", collecting cheques on behalf of GOSH at various events and functions for the following two years. "The Wishing Well" debuted on the Bruno Brookes Show on BBC Radio 1 on 9 November and was released on the 20 November. It would peak at No. 22 in the UK in late January 1988. In late 1988, all four members of Slade donated various items for auctioning by the Slade International Fan Club in the effort to raise money for the charity. The Wishing Well Appeal would raise £54 million for the hospital. A music video was filmed to promote the single. It featured some footage of the hospital and the care it provides, along with footage of the song being recorded. "The Wishing Well" was released on 7" and 12" vinyl by MBS Records in the UK and some territories in Europe. It was marketed by MBS, and manufactured and distributed by PRT Records. The B-side, "The Wishing Well Message", features a number of messages from those pop stars and other celebrities involved in the single, including Holder who said: "Hello there, this is Noddy Holder from Slade. I'd like to wish you all a very merry Christmas, [sings] we wish you a merry Christmas, we wish you a merry Christmas, we wish you a merry Christmas and a happy new year! Send all your spare cash to the Great Ormond Street Hospital Fund now!" The 12" vinyl version of the single had "The Wishing Well (Message Mix)" as the featured track, which merged the spoken messages of the B-side with the song. In 1988, a remixed version of the song, the "Steve Walsh Club Remix", was released as a single in the UK, France and Spain. The original version was also released in more European countries along with Australia. For the 1988 7" vinyl release issued in European territories, an instrumental version of the song was used as the B-side.